Proposing is a magical moment where you ask the love of your life to be yours for a lifetime. You’ve spent a lot of time making sure that the proposal is just right, but the emotions can make the memory hazy. To make sure you do justice to all the planning and effort you’ve put in, consider hiring a photographer for the occasion. You’ll have priceless shots to cherish always, and she’ll be thrilled that you went the extra mile to capture the moment so beautifully! When emotions are high, sometimes we lose the moment. Romantic things are said and done that feel like a blur later on. That’s where hiring a photographer comes in: a photographer will capture the entire proposal, from start to finish, so you don’t lose the details. 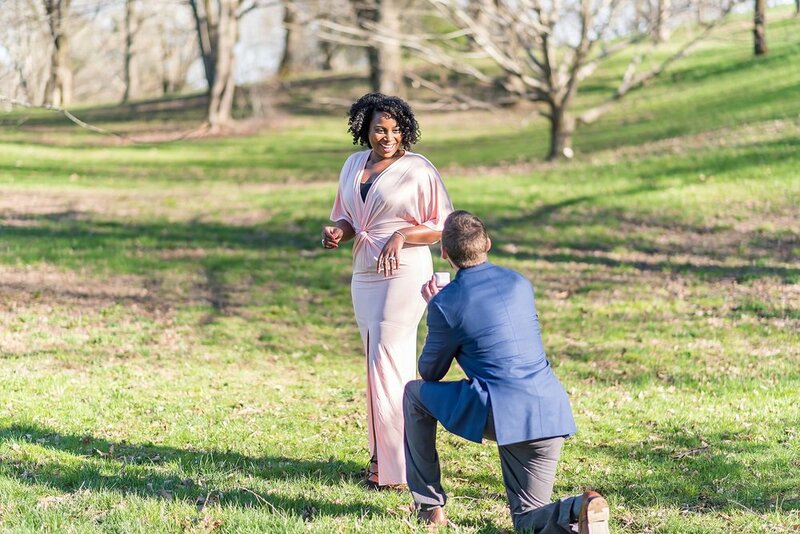 It will be fun to look back later on the facial expressions you made throughout the proposal, and the photos will instantly transport you back to that butterflies-in-your-stomach moment. The best part of hiring a photographer for your proposal is that you have tangible evidence of the event that you can share with family, friends, and loved ones. And, like your future engagement and wedding photos, you have more memories to add to the story of your love. Using a photo from your proposal shoot might just be the winning photo for personalizing your Save the Dates, too! Many people believe hiring a photographer will ruin the surprise of the proposal—but a good photographer will stand at a distance (or even hide in the bushes) so your bride-to-be doesn’t suspect a thing. Besides, you will meet with your photographer for a consultation ahead of time to map out exactly where, when, and how everything is happening. Photographers are very adept at capturing moments while remaining quietly undetectable, and your love will be so blindsided by what is happening before her that she will be focusing on you and you only. For these reasons and many more, hiring a photographer to capture your proposal will certainly not be a choice you regret.